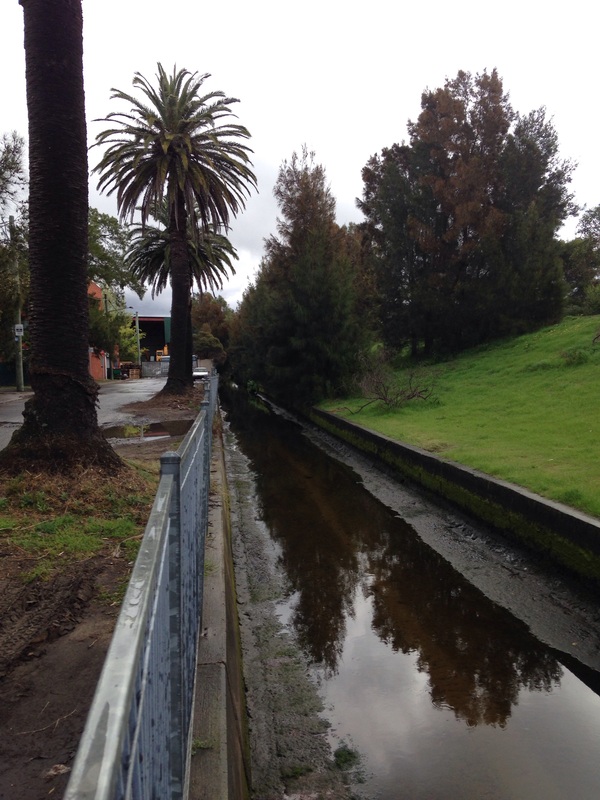 Queanbeyan City Centre: The Ugly Face of Canberra? In an article titled “The Golden Age of Planning” (1985) urban planner Karl Fischer mentions that Queanbeyan is sometimes known as “the ugly face of Dorian Gray” in relation to the more beautiful and energetic Canberra. Inevitably, once people make criticisms, a counter perspective also emerges which claims the derided thing is in fact authentic in comparison. Then you can’t tell whether the claims to authenticity are real or ironic. Such is the discourse concerning the relationship between these two regional cities, between Canberra and other capitals, and it characterises the uncertainty and dynamism concerning taste-based judgements in general in contemporary society. As the cliche goes, beauty is in the eye of the beholder. But what are consequences of such radical subjectivity when it comes to matters of taste, particularly when pretensions to universality seem almost unavoidable when we make claims about the aesthetic status of a place, thing or event. It’s beautiful for me, but I feel this compulsion ought to compel you too! These are big questions that will not be directly addressed in my account of Queanbeyan (largely focused on the city centre), which is one highly specific Queanbeyan among many, and something that participates in a regionally shared and in this sense universal idea of the city. Queanbeyan is a small city pushing 40000, blessed with natural amenity: plenty of bushland for walking, dirt biking or riding horses, and a river close to the main part of the city. The banks of the river could be far more sensitively incorporated into the shopping areas. There are snapshots of what could have or might yet be in this regard with the Riverbank and Mill House cafes making good use of the riverside, offering people a nice place to sit, socialise, relax and have a refreshment. By contrast, the massive Leagues Club and the main shopping centre are in significant debt to the streetscape if you believe that buildings ought to balance an economy between obligations to the people they house on the one hand, and landscape in which they sit, on the other. Despite this, the Leagues Club is a bit of fun, at least if you’re not in the pokie room. They take their steaks seriously and there’s a nice view over the river from the restaurant. From the outside the building is a classic piece of expressionist post modernism, a clash of waves, boxes and cylinders in bluish reflective glass and light cement, seeming to float along with the street. There’s a bit of bare earth on riverfront below that’s being transformed into a community hub, which is a promising move to make better use of one of the prize features of the city. An artist impression of the proposed upgrade to riverfront. Image: SMH, 2015. In and around central Canberra (if there is such a thing), the government and residential architecture of the interwar and post war years of the twentieth century dominates the overall impression. 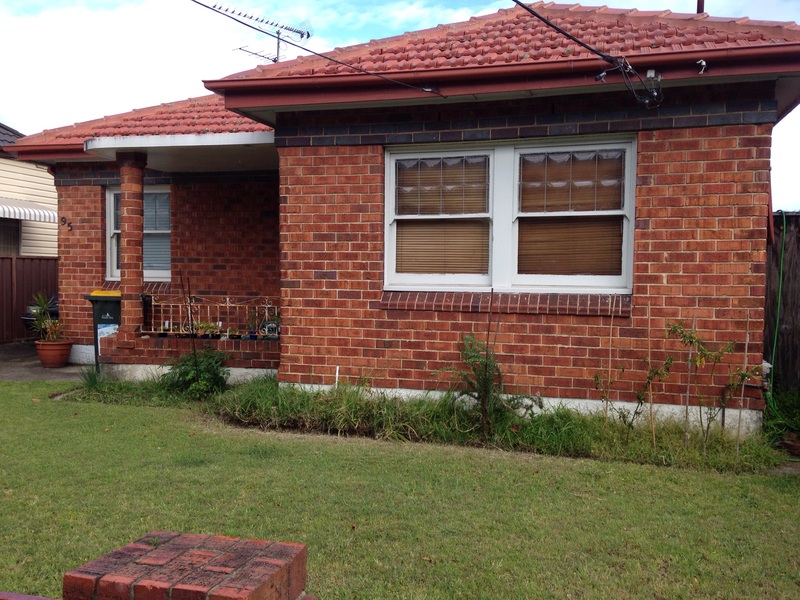 In Queanbeyan the balance is different due to smatterings of pre-Federation and Federation Era red brick cottages that are more common in NSW towns. These older buildings sit alongside new apartment blocks and hulking civic buildings, such as the brutalist courthouse, built in the 70s by government architect Ian Thompson and the newer Queanbeyan Government Service Centre, designed by Bates Smart Architects. The Courthouse is made from chunky concrete and the Service Centre clad in rusted metal. Both are large enough to radiate an influence far beyond the space they occupy and fit in well with industrial and rustic stereotypes proper to the area–although, this stereotype is in good part fantasy, more than 20% of people in Queanbeyan are employed as clerical and administrative workers, 19% as professionals, 13.9% as trades workers and technicians and 7.6% as labourers. This combination of smaller, older cottages, peppered by large, newish civic architecture creates a sometimes unique feel at street level. These bulky, vaguely menacing visions are in stark contrast to the Arts and Crafts whimsey of the Queanbeyan Business Council, with its stucco and red brick. What looks to be a more recent public toilet achieves some aesthetic continuity through replicating the crescent form used in the Business Council entrance. The Legacy Garden of Remembrance, where the building’s garden meets the footpath, is an unpretentious war memorial featuring fake turf and small plastic crosses. The gateway to the Show Ground is a passage from the streetscape to a background with a different set of spatial and cultural characteristics. 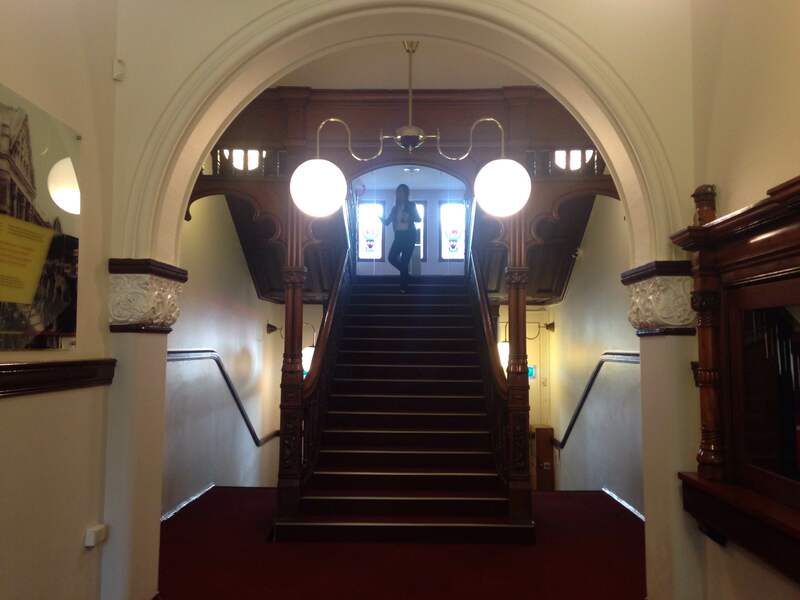 The Member’s Entrance and ticket booth, the old scissor gates and even the old lamp all add to the effect. Shame about the Security Warning sign on the new fence to the right but luckily the gateway overshadows it. The Show Ground encompasses a heritage listed reserve that was used a camping ground by the first Australians. Along with the Show Ground entrance, the Oliphant building, designed by Ken Oliphant in the mid 1930s, is another example of Art Deco heritage in the town. It’s recently been repainted and rebooted so the clock now tells the time. Unlike the kind of visual information that screams at you from the advertising splashed along awnings and jutting street signs, a street clock asks you to look but offers something back in return: the service of telling the time. There’s something in that. Elements of the town are developed with a sensitivity to the same Garden City principles evident in Canberra. Morriset Street is a tree-lined boulevard that runs between the river and what perhaps the city’s best amenity, Queanbeyan Park, a multifunctional combination of formal and informal recreational and leisure space. The park features an outdoor velodrome that runs around the outside of the always immaculately kept oval. The informal park at the shoulders of the oval features well developed trees, a landscaped garden complete with a little footbridge, water feature, rock sculptures, a memorial podium and a fountain. There’s also a number of shelters with tables and benches and two stages for public events, one a curious quarter sphere form. Conforming to the picturesque tradition, the formal area within the park is flat, while the garden is situated within undulating terrain. It’s got all the right contrasts: shaded and open, formal, semi-formal, informal leisure and recreational spaces, rugged and landscaped. The park is well serviced by dog walkers, I’ve seen a few cyclists on the velodromes and a big group play casual cricket on the oval. There’s a footpath you can take from the park to the main street through the courthouse which invites some of the greenery into the perspective of the main street and has a kind of pleasing secret passage feel. The 1938 structure was built as part of a work for the dole scheme, led by James and William Pike and Henry Hungerford. It cost 400 pounds to build. Painted white, it is at once minimalist in its use of materials and tensile building principles, and reassuringly strong. Bridges have been meditated upon by philosophers such as George Simmel (“Bridge and Door”, 1994), Martin Heidegger (“Building, Dwelling, Thinking”, 1951) and Michel Serres (“L’Art des ponts”, 2006). They are mediating structures that connect previously disconnected places while allowing the natural landscape to persist in an uncompromised condition. 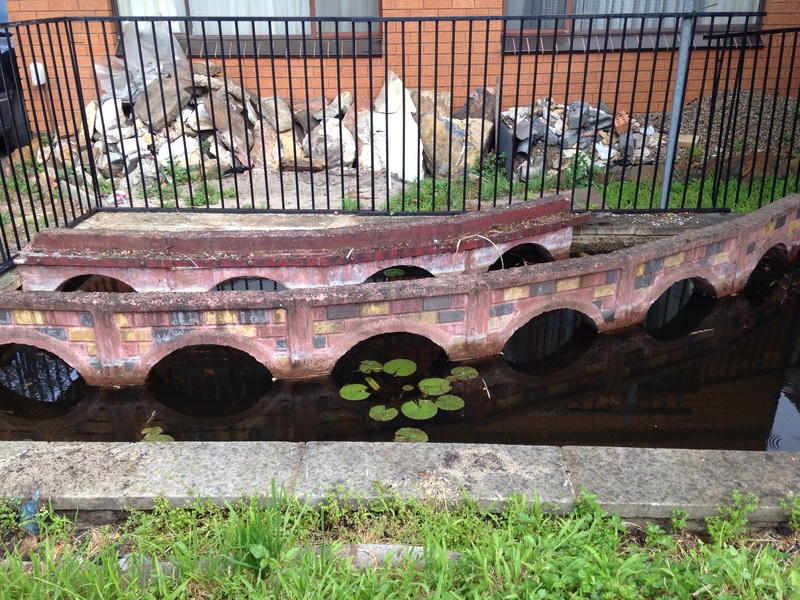 In this sense they are a model for all architecture and the Queanbeyan footbridge is no exception, long may its presence continue. 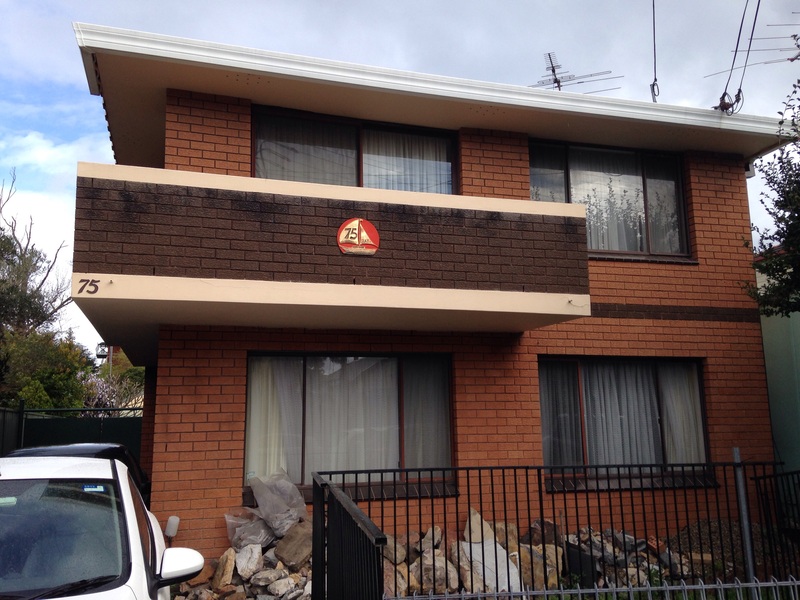 Elsewhere in Queanbeyan there are Howard Arkley esq mid to late century suburban homes, often immaculately kept though rarely with signs of activity out the front. An abundance of heavy duty window shutters suggests some hot summer days. 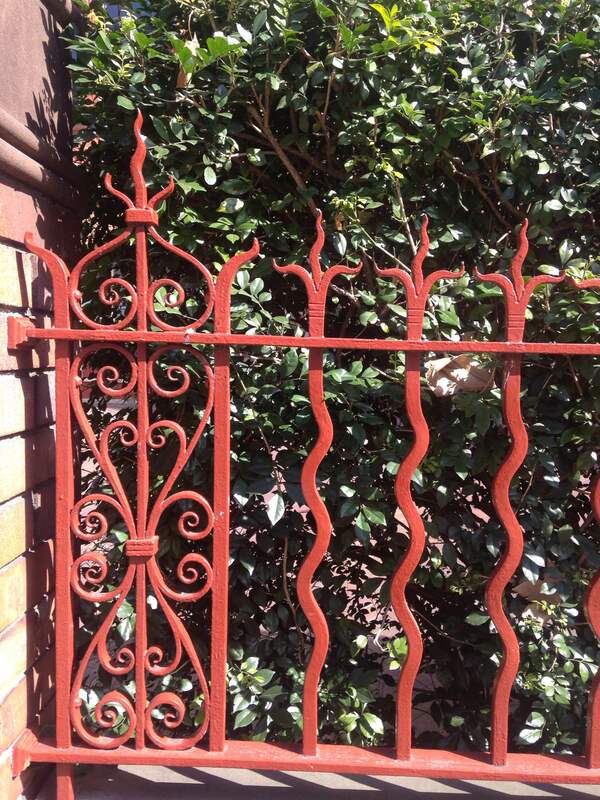 One of the greatest aesthetic tragedies of the modern suburb is the Colourbond fence and there’s a few of those. I’m sure I’ll live but these fences seem to sum up all the bad aspects of suburban design: an often very understandable but zealous desire for privacy; emphasis on speed of construction, price and function; and a complete lack of sensitivity to visual amenity for the landscape outside your own patch. Having said that, the things are so pervasive whacking one up is in continuity with the landscape in general, so maybe it’s a gesture of neighbourly fidelity after all? One thing that you could say for certain about Queanbeyan is that it fulfils the sometimes laudable, sometimes paranoid Australian predilection for not appearing pretentious. There’s a lot to like about the place, as the signs into the city say, it’s a place with ‘Country living, and city benefits.’ Hopefully the right mix between these two different lifestyles is retained in the future. There’s certainly scope for developing the urban services so that the natural amenity is multiplied at the same time. The ease with which the pedestrian can transition from a busy main street to a secluded park, show ground or river bank ought to be maintained as the city grows. And the large scale shopping precincts will hopefully behave themselves and limit their spread in the areas alongside the river. There’s no need for a giant windowless lump to be right on a river and it impinges on the scope for smaller businesses and recreational facilities to capitalise on the atmosphere. Graham Hammill’s Sexuality and Form: Caravaggio, Marlowe, and Bacon features an analysis of ‘The Baltimore Panel,’ a painting also known as ‘The Ideal City’ and usually attributed to Fra Carnevale. Hammill describes the urban space represented in the painting as “extremely pacified, regulated,” a “monumental assertion of emptiness” where “motion […] is burdened by vacancy” (24). Hammill notes the way the figures in the painting are “literally cut through by the lines that give the painting its pronounced perspectival feel” (24). The largely empty piazza is surrounded buildings in different historical styles. However, the dominant feeling isn’t one of vibrant diversity. Instead, it is the emptiness of the square, with its clean horizontal lines in the foreground and middle ground. The surrounding buildings of uniform volume prevent a sense of openness that a distant horizon would afford. This combination of emptiness and confinement create a particularly disquieting affect. It doesn’t take a vivid imagination to recognise the similarities between the mood of the urban landscape in this picture and Sydney’s most rapidly developing suburb, The Green Square Urban Renewal Area (GSURA). By 2030, the GSURA, which encompasses Zetland, Waterloo, and parts of Alexandria and Rosebury, is set to become the most dense area in Sydney. It is already full of new, three to ten story apartment blocks and areas of landscape gardening that are still yet to acquire the lived-in feel that gives the places a sense of warmth and comfort. From a car (the Eastern border will be familiar to anyone who uses South Dowling Street for their daily commute) it can seem an alienating space. 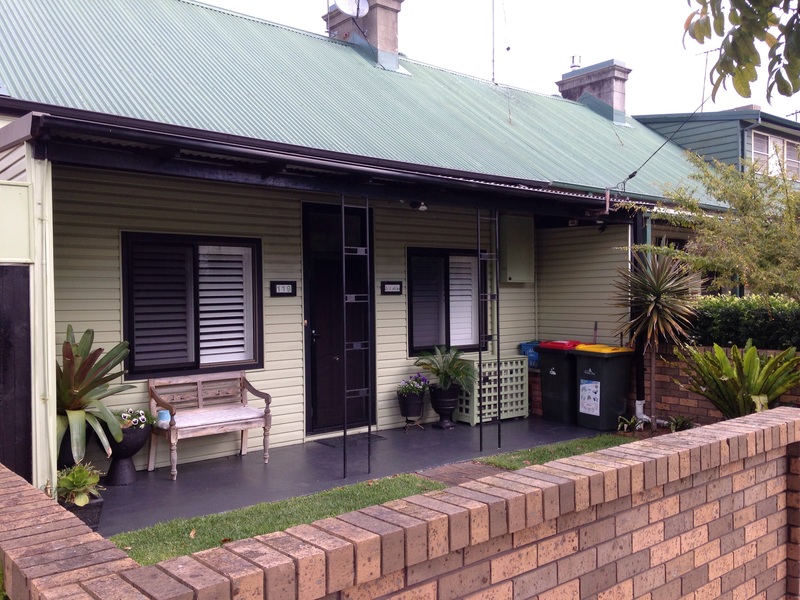 The previous suburban format of a brick bungalow on a quarter acre block has been scaled up to an apartment format that is high enough to obscure any far horizons–just like Carnevale’s piazza. 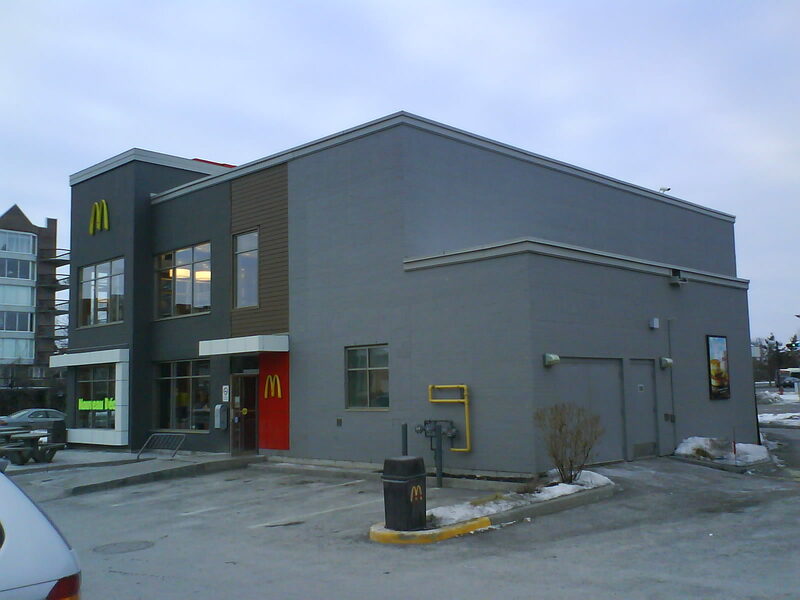 Many of the characteristics for which suburbs have traditionally been criticised are still in place: superficial novelty against a background of sameness, buildings that facilitate a culture of co-isolated living where residents move between the home, work and the supermarket with minimal interaction. 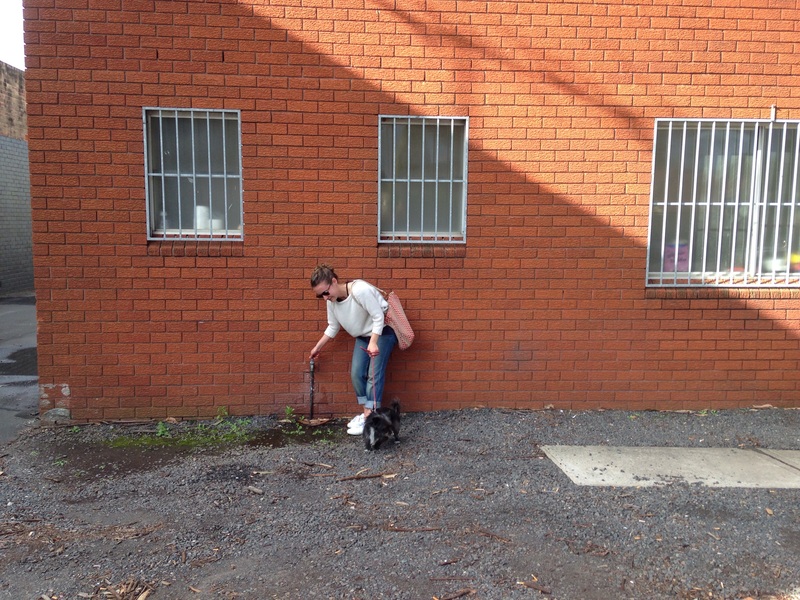 The mixed businesses of twentieth century suburbia have been exchanged for doggy day care centres and late-night gyms, backyards with grass lawns have been exchanged for landscaped parks. It’s easy emphasise the dystopian aspects of such an urban environment. From the outside the atmosphere can easily give off negative affects. Just like ‘The Ideal City’ many of the spaces have a strong perspectival feel that makes them look like materially realised architects impressions. The streetscape lacks any of the traditional markers of the quaint common to the buildings in the Federation Style, which were standard in suburbs of the first half of the Twentieth Century. 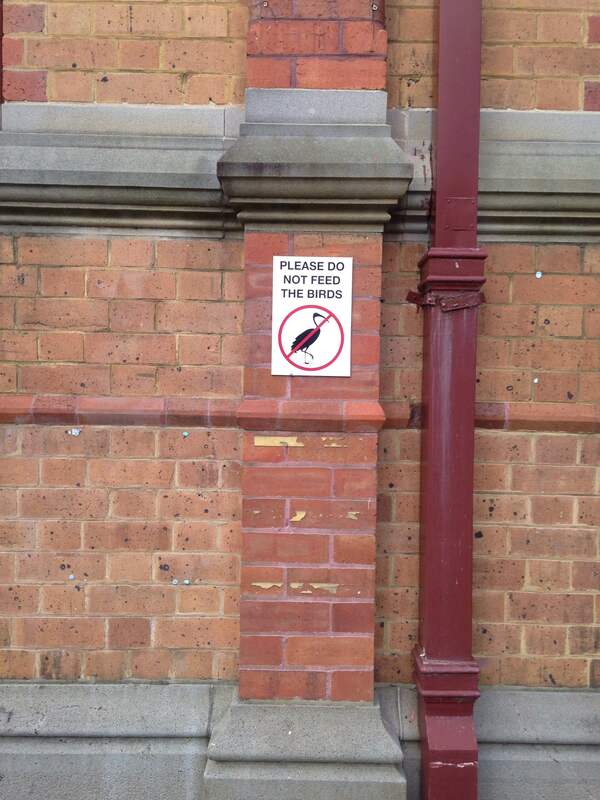 There’s no red brick or coloured glass panels. 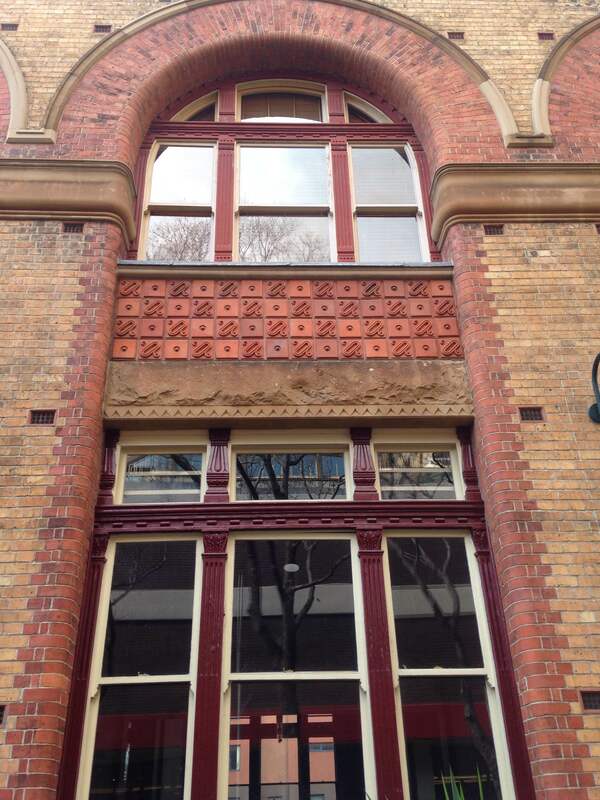 No decorative wood or cast iron fringing verandas. 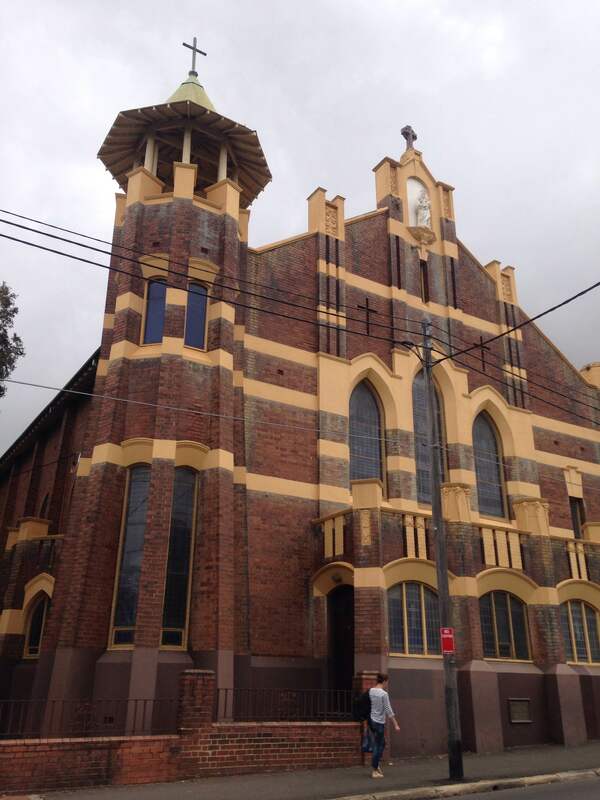 No chimneys, terracotta, pitched roofs, corrugated iron, stucco, exposed wood or tiled risers. While the content and scale are different, a similar stylistic adherence to pastiche remains. Functionalist and minimalist principles that often typify modernist architecture are present to a certain degree, though not in any strict sense. Instead, buildings advertise themselves through all manner of features. 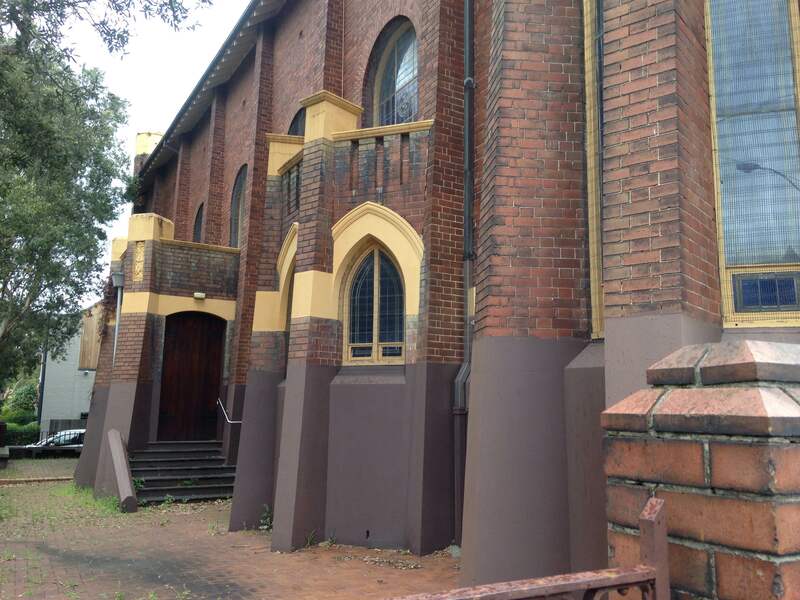 These might be colourful panels, unusual fin-like protrusions, patterned screens, lashings of wood, pointless additions that are meant to look essential to the structure, shiny red or blue brick simulacra, and different shaped loggias. The area is not likely to please anyone with a preference for the vernacular, modernism or combinations of the two. However, there’s a strong argument to be made for the role genericism plays in making something readily adaptable to the lives of people who don’t register meaning in stylistic references to an Anglo or Eurocentric past. This is a post modern International Style that is more bulky, garish and fun. To experience this urban landscape is to undergo “the affectively low key response to minor differences perceived against a background of sameness” that Sianne Ngai names as characteristic of the minor aesthetic category of ‘the interesting.’ The Sydney Architecture Blog encapsulates this sentiment when first speculating that in twenty years time the area will be a “museum of kitsch” (perhaps architectural critics where saying the same thing about Haberfield in the early twentieth century?) followed by the qualification that: “Like it or not it has some interesting forms going on.” That seems about right. There’s nothing is definitively impressive or disgusting about the GSURA. It takes a while to work out what to make of the place. Strong reactions of cynicism or defensive reverence wouldn’t seem to get to the truth of the matter. Some things are kind of good. While others seem a bit ill advised. The largely empty, permanently shaded and windy areas that look as though they’ve been set aside for public usage. It’s hard to imagine anyone enjoying themselves in these spaces unless they’ve treated themselves to one of these packages. There are still occasional glimpses of the area’s industrial past, a crumbling brick wall and some rusted corrugated iron squeezed in between a warehouse and an apartment, or a an old industrial brick facade soon to be dwarfed by a new residential development. At the South Dowling edge there’s the exemplary, heritage listed AGM Glass Factory (now Kennards hire and a great example of the International Style) that, along with the old Reschs Waverly Brewery, is a worthy border for the area. Development proposals are displayed along the boundary fences of the two hectares of land that feature a heritage listed water pumping station and valve house. Dahua Group acquired the site in 2015 and have enlisted ASPECT Studios to build approximately 450 units. Along with the audaciously named Infinity by Crowne, which is underway right on top of Green Square station, this and other developments mean more of the same for the GSURA. It’s sensible to be anything but ambivalent about the future. Perhaps the influx of new residents will bring an increased buzz to the area, with more of the new shops, restaurants and cafes that make it a decent place to live. But the blindingly bright, soul nourishing horizon, which shines through the gap in advertising signage for Crown’s Infinity apartment complex is going to be become something most residents, and certainly most pedestrians, will have to develop routines to seek out or substitute should they want to avoid living in the confines of ‘The Ideal City.’ With Centennial Park just over the other side of South Dowling and the beach not too far beyond, I suppose that’s not too much of a tall order. Hammill Graham L. Sexuality and Form: Caravaggio, Marlowe, and Bacon. University of Chicago Press, 2000. 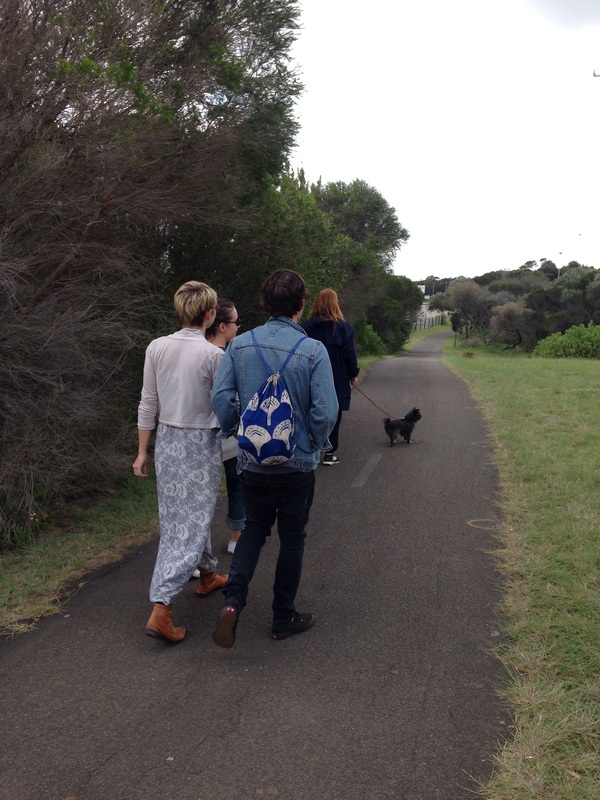 The Botany walk comprised five guests, four human and one dog. 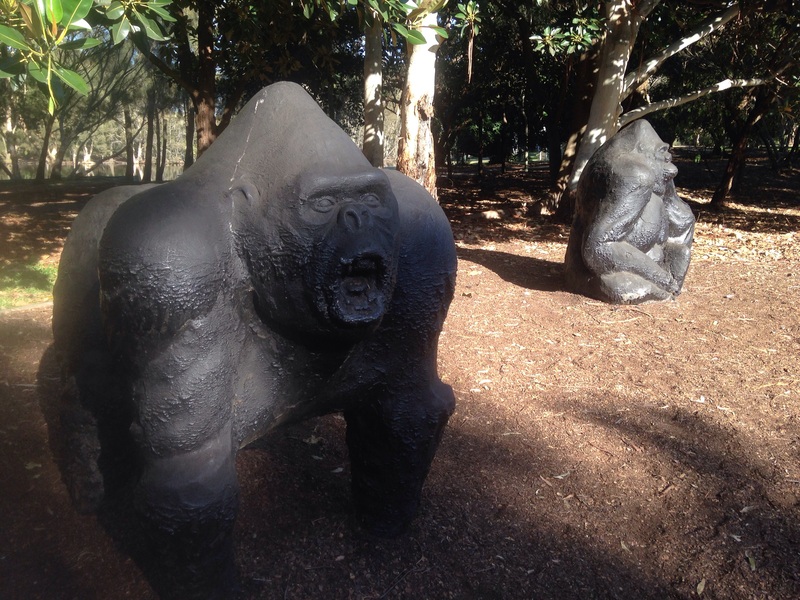 We began in Sir Joseph Banks Park, the sight of what was perhaps Australia’s first zoo and for a while the only place in the country to feature an elephant. What were previously flesh and blood animals are now cement or metal sculptures. 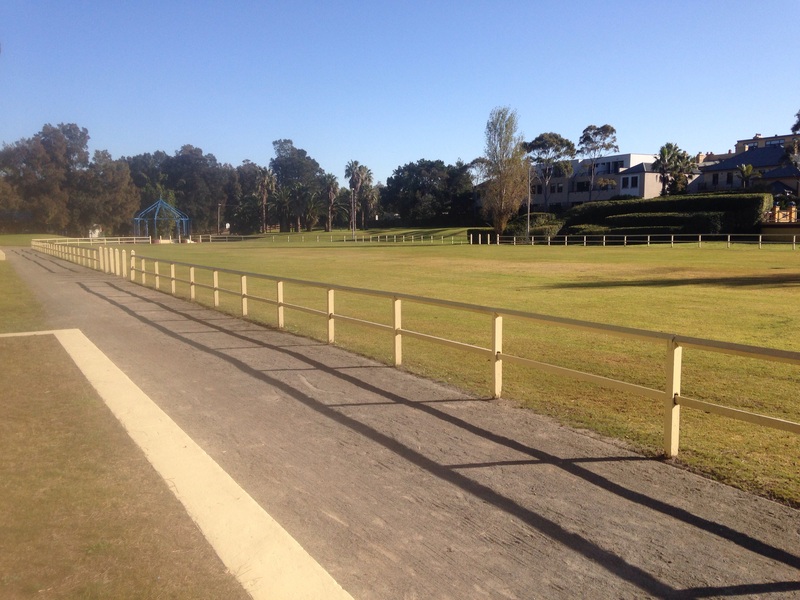 The old cinder athletics track, marked out by a white internal fence, used to be home to the popular handicap race, the Botany Gift, and was once graced by the great indigenous runner Charlie Samuels, who would run in bare feet. Like the story of many indigenous folk from that time, Samuel’s is a sad one, involving booze and incarceration (for melancholy). 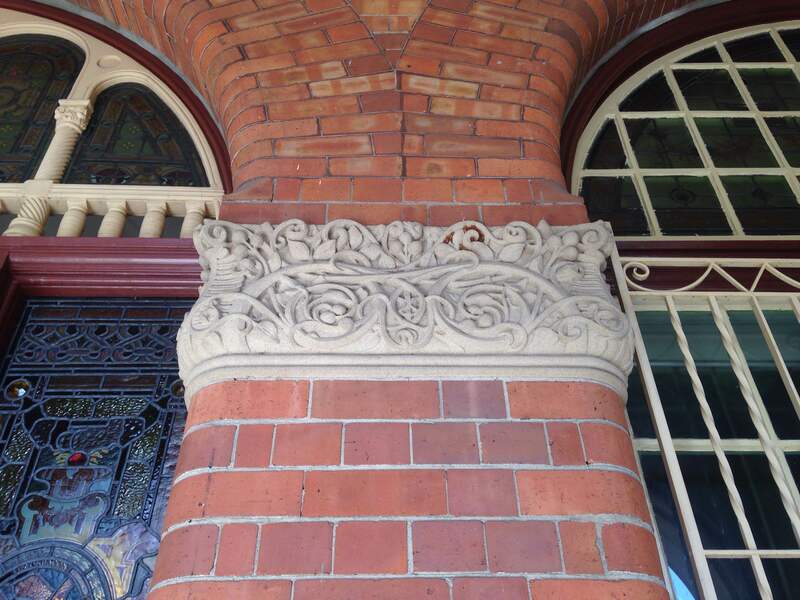 We had a look at the impressive old Sir Joseph Banks Hotel, which is now a residential block, though it is well maintained and features an abundance of cast iron filigrees and an expansive tile balcony. From here we returned to the park, following the sandy ground and swamps that were once the dominant characteristic of the area. It’s a peculiar place to walk, because the bush is a dominant visual feature for a lot of the time, however the sonic environment is pervaded by sounds from the nearby highway and the airport. Some of the thicker, palm and fern studded bush looked like the hiding spot for a dead body. After crossing a precarious stretch part of the road (no pedestrians) that led back towards Botany Rd, we found ourselves thoroughly immersed in residential Botany. It began to rain. A fortuitously placed set of stairs led us over a cement sewer and into the shelter of the overhanging lip of a closed garage. After sheltering for about five minutes we emerged into what would fast become quite a pleasant afternoon. 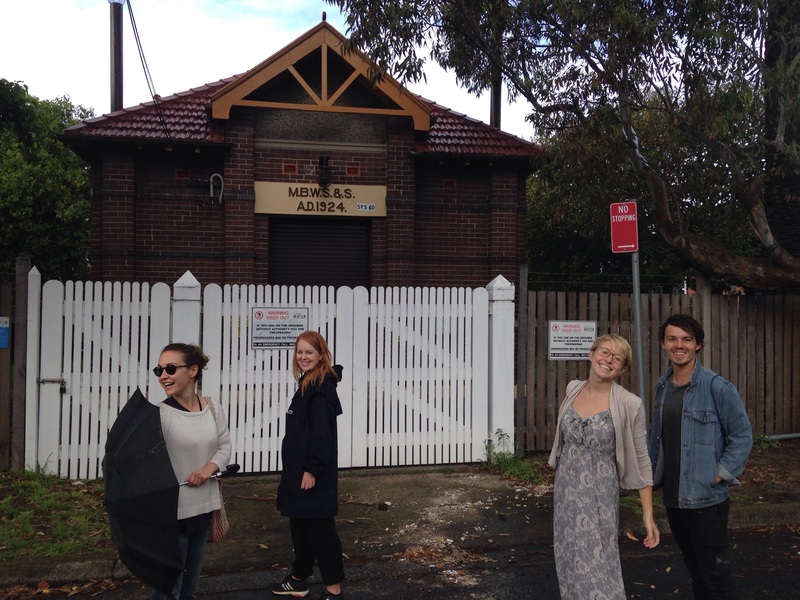 Almost by accident we discovered the infamous Sewage Pumping Station No 60, a piece of infrastructure in the Federation Free style that offers an interesting example of a domestic architectural style in a piece of civic infrastructure. It’s the reverse of todays trend were the industrial staples of cement floors, exposed pipes and subway tiles are now fashionable in houses and trendy cafes. We followed Bay St back to Botany Rd, which on one side is lined with workers cottages remaining from the old fishing village, and on the other by a long open sewer and row of Canary Island Palms which index the lost history of Ascot Race Track that existed in the area before the airport. We followed Bay St across Botany Road and up to Booralee Park, where I had run on only a matter of days earlier. Unlike the relative desolate park I’d been greeted with on Tuesday, today it was filled with activity in the form of several cricket games and a decent crowd of parent spectators. Unfortunately we didn’t manage to find the old horse trough that was uncovered in the park during an archeological dig, but we did find an old toilet block and a large group of ibis perched at various intervals on the fronds of the palms, agreeing that a large palm tree would be a good spot for a bird to perch and take stock for a while. 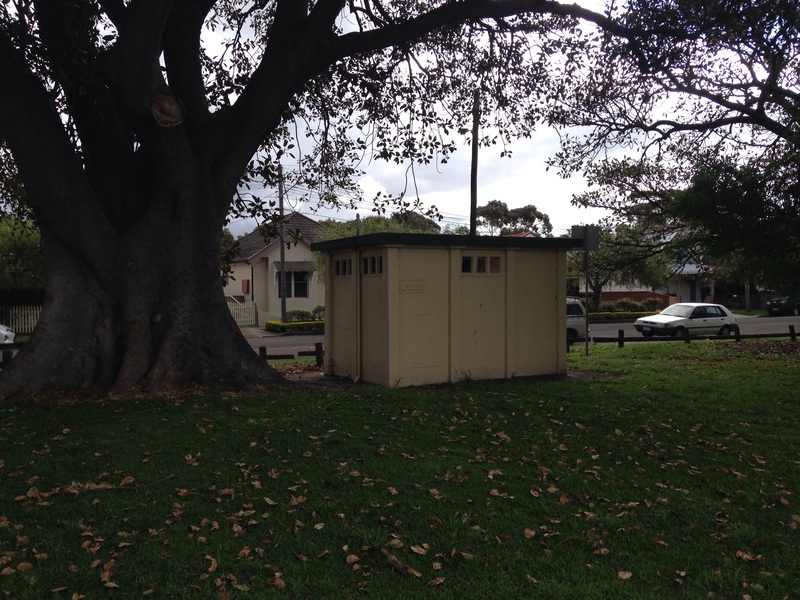 I took this opportunity to mention that the park was gazetted in the 1920s and points to the long history of pubic recreational facilities being offered alongside industry in the Botany area. 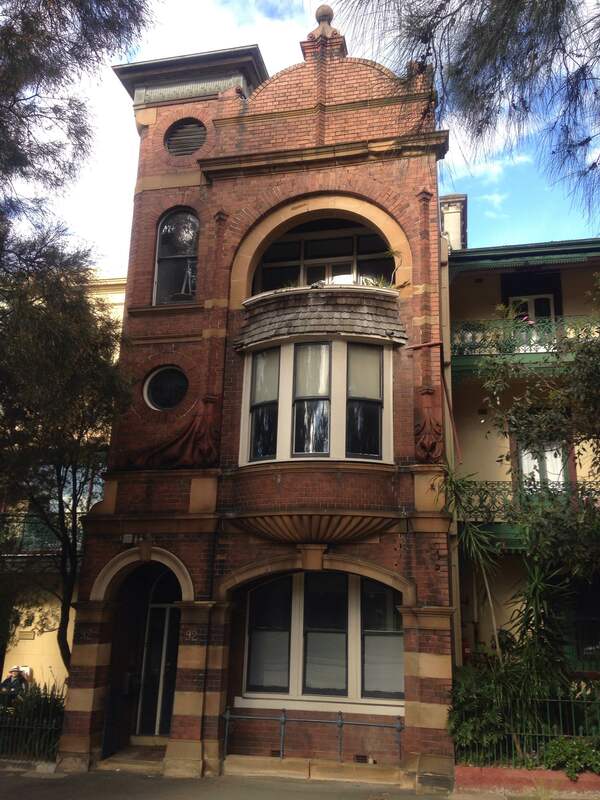 The houses along Bay St offered a continual source of interest as proud displayers of the ‘featurism’ which Robin Boyd identified as a symptom of the Australian ‘she’ll be right’ attitude to aesthetics. My view on the matter is that Boyd’s laudable high standards for the built environment were perhaps a little too closely aligned to the aesthetic pretentions of the sublime and the beautiful, with too little slack given to the more modest expectations that things might be agreeable, charming or interesting without necessarily having to offer transformative, inspirational experiences through harmony or feats of daring and imagination. The flaw with my own view is that it would seem to lend legitimacy to architecture without ambition, architecture that merely repeats inherited styles as reference points, without the force and vivacity of the originals. And here we enter the much threshed over turf of a debate between modernist and post modernist ideals. Does an antipathy to discourse involving the sublime or the beautiful necessarily mean one is condemned to populism, the middlebrow and cheap tricks? I’d like to think not. Either way, the old Alto Corner Store (now preschool) is a well preserved buildings of this type. We took a right off Bay and then met up with Banksia, which took us back to Botany Rd, via Botany Fire Station that I’d been so impressed with five days ago. By this stage of the walk everyone was in need of refreshment, including the dog who enjoyed a palm full of water from my water bottle. The last stretch along Botany Rd was largely completed in a hurried silence, with some questions about the curvature of corrugated iron roofing on some of the verandas and distinctions being made between the cottages of menial workers and artisans. Just across the road and down Harris St a bit from UTS Building 6 is the Ultimo TAFE, formerly the Sydney Technical College and Technological Museum. It stands out amid the newer large buildings that tend to be glass and steel–though the new Frank Gehry is an exception. 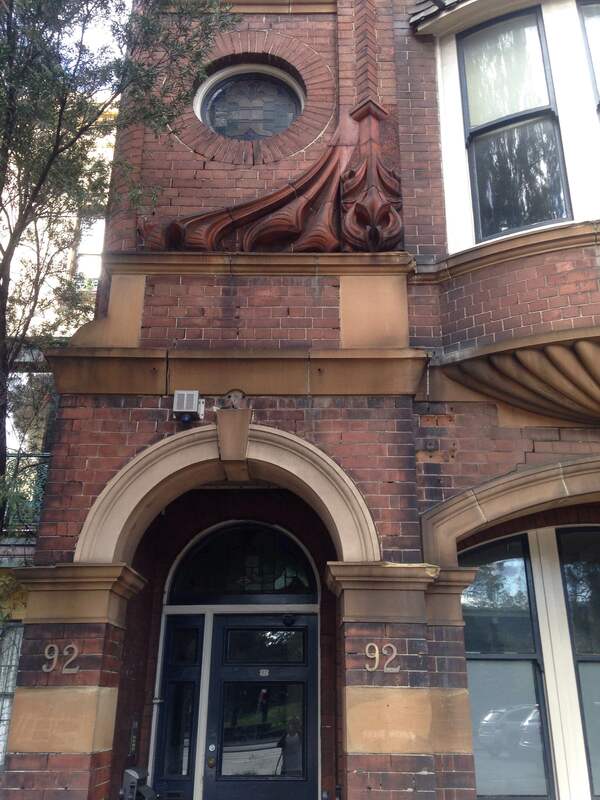 Unlike Gehry, TAFE features polychrome brickwork and an abundance of fine sandstone carvings (over 100 on the facade) largely of Australian flora and fauna. William Kemp designed the building and most of it was completed between 1891 and 1893 in the Romanesque Federation style which I identify in opposition it the gothic because the archways and windows are curved rather than pointed. The building feels it belongs somewhere hotter than Gothic buildings do. The stonework on the building is worth a look just in itself, there’s cockatoos, marsupials, cassowary, possums, eucalyptus, corral trees, banksias, lizards, ferns, flame trees and various other pods and leaves. The building looks good against the large palms which would otherwise seem a bit out of place in this part of the city. I often find the use of palms, ferns and spiky fern-like palmy things (especially these) a bit misplaced in urban Sydney, but sometimes they work (another example are the four palms in a square outside the ranger’s lodge near the Robinson Gates to Centennial Park, very evocative). 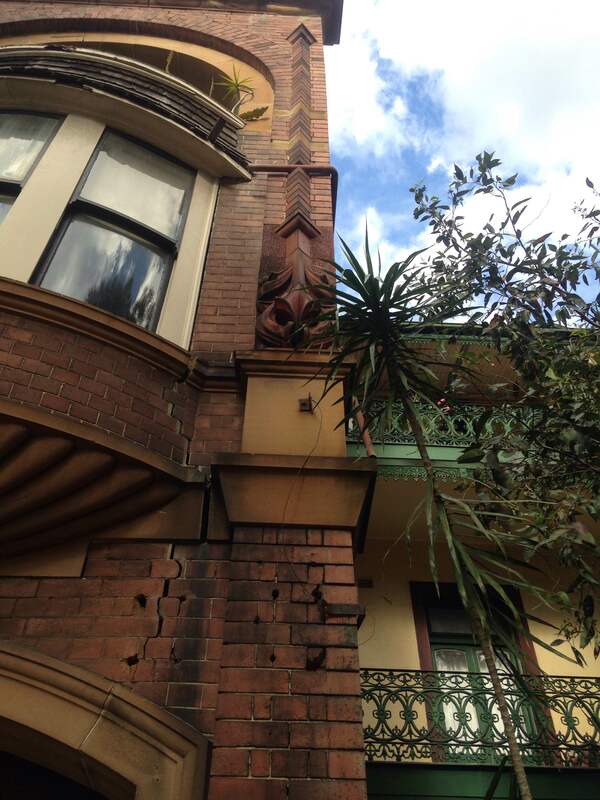 There’s also distinctively patterned terracotta tiles on the facade that seem almost to herald Tetris or some other game from that era, and the feature that I kept finding myself ogling, the large, knob-like sandstone finials which in my experience lack a comparison in this city, finials are almost guaranteed to be pointy and delicate rather than blunt like this lot. 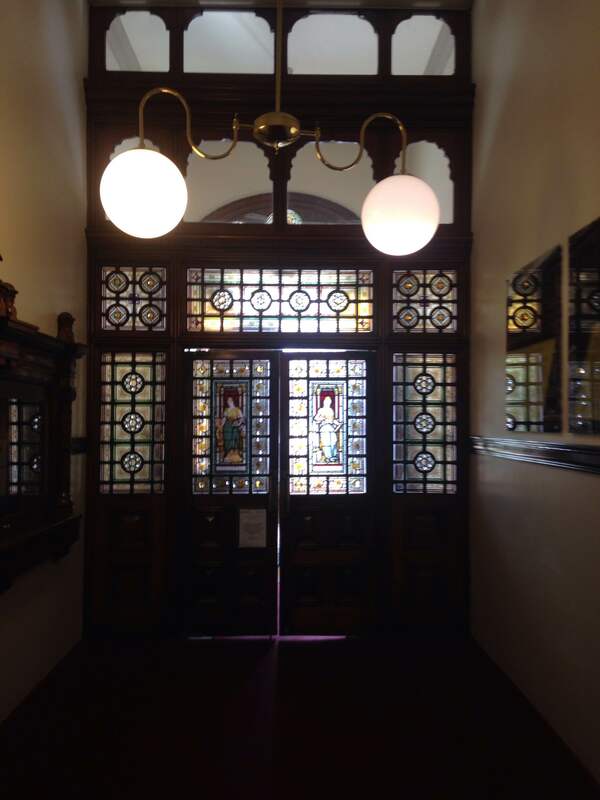 If you snoop around the building you’ll find a number of stained glass windows with the marriage of the arts and industry a key theme in the various scenes, and inside a decorative wooden staircase with plenty of excess panelling. 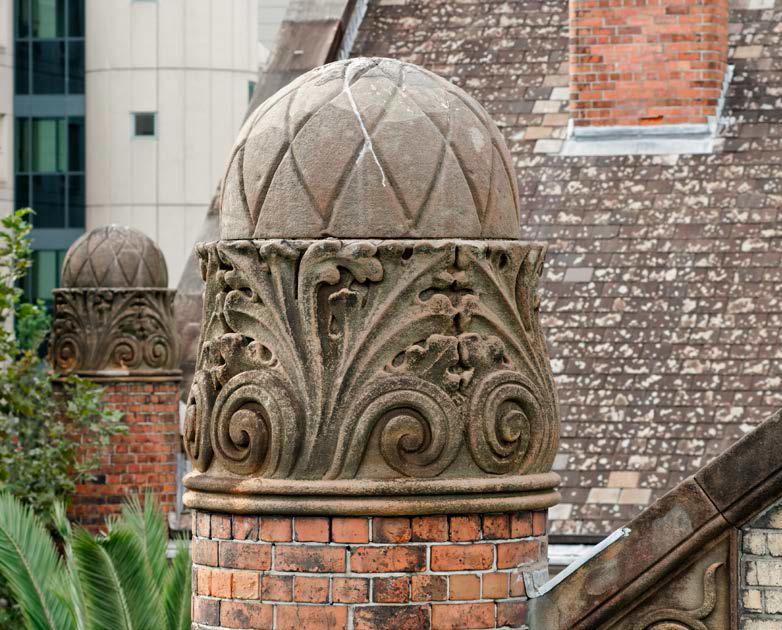 In addition to the palms, the local Ibises make the building feel a bit warmer too, you’ll often see them perched on the finials or roof ridges. 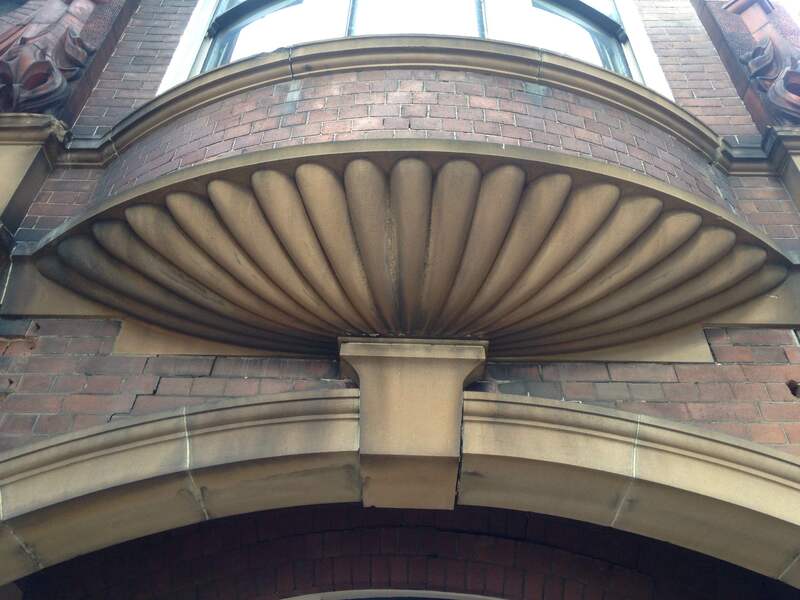 You can find out more about the architecture of Ultimo on this gem of a blog. 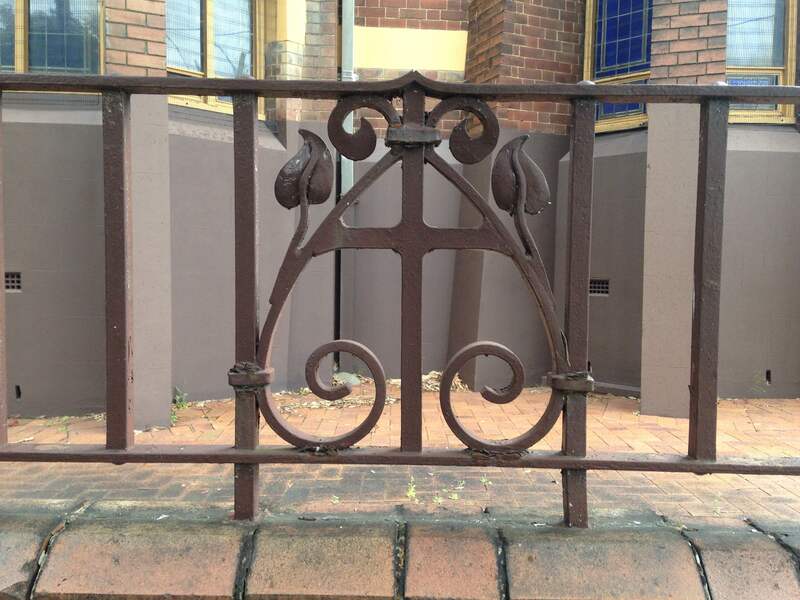 One of the few genuine examples of an Art Nouveau terrace in Sydney. 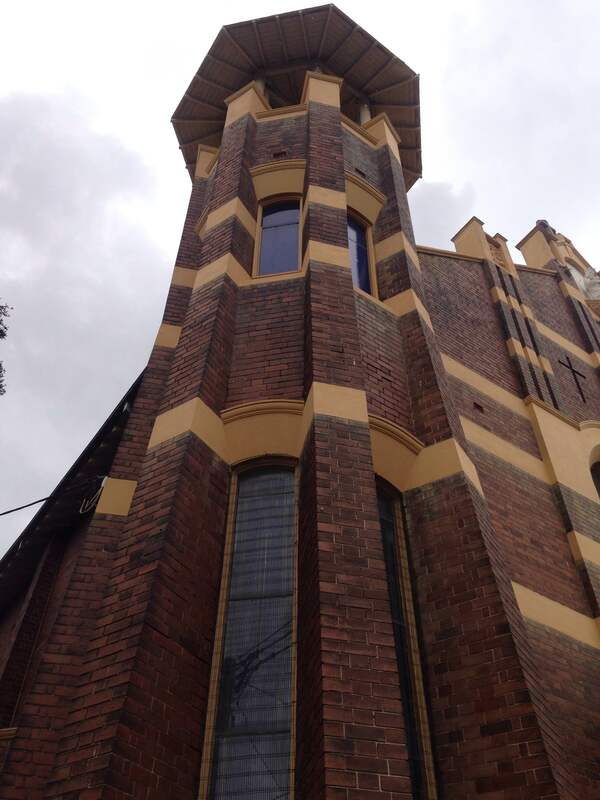 An impressive sight: distinctive Art Nouveau detailing, porthole windows, shingle awnings above the bay window on the first floor, sandstone carvings on the facade that run down the building like viscous droplets of water, spherical sandstone finials, semi enclosed porch and a small turret. Next to the relatively spindly federation terraces its an imposing sight and well worth a detour.